When booking your Myrtle Beach golf package, the two main components that you are looking at are the Myrtle Beach golf courses that you will be playing and the Myrtle Beach golf lodging where you and your group will be staying. Myrtle Beach Golf Authority teams with their sister company, Elliott Beach Rentals, to provide the best Myrtle Beach golf lodging that is offered for your golf package. 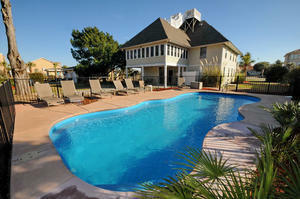 There are several options in Myrtle Beach golf lodging to consider when booking your golf package. How many are in your group? Smaller groups may consider a condo, while the larger groups may want to consider a beach house for your Myrtle Beach golf lodging for your golf package. We have a variety of condos – that range from 1 bedroom to 6 bedrooms and beach houses – some up to 10+ bedrooms. Does each golfer need their own bedroom or just their own bed? If you are willing to share a room with two beds so that each has their own bed, then you may be able to book a smaller condo or house for your group and your Myrtle Beach golf lodging can be reduced in cost. Speak to your golf specialist and ask about the number of beds in the Myrtle Beach golf lodging options. Is Oceanfront a necessity? If you want to enjoy being directly on the oceanfront while in town for your Myrtle Beach golf package, that will affect your options in your Myrtle Beach golf lodging. We have many oceanfront condos and beach homes to choose from. We also have channel houses, Myrtle Beach golf lodging a few blocks from the beach and those that are across the street as well. If you are looking to reduce your costs in your Myrtle Beach golf lodging, not being oceanfront could be a reasonable option. Amenities, Amenities, and more Amenities…. Is your group looking for Myrtle Beach golf lodging just to sleep or will you be spending time there and looking to enjoy the beach as well as the various Myrtle Beach golf courses? The condo buildings have many amenities such as pools (both indoor and outdoor), lazy rivers, hot tubs, fitness centers and even a gift shop. If you are looking for more privacy in your Myrtle Beach golf lodging, but still a list of amenities, we also have beach houses with pools, game rooms and even some with a hot tub and theatre! Ask your golf specialist about all the amenity options that you have in your Myrtle Beach golf lodging. Regardless of what you are looking for in your Myrtle Beach golf lodging, we have something that will meet your needs, wants and budget. We will help you pick the perfect Myrtle Beach golf courses and Myrtle Beach golf lodging to make the best golf package for you and your group.